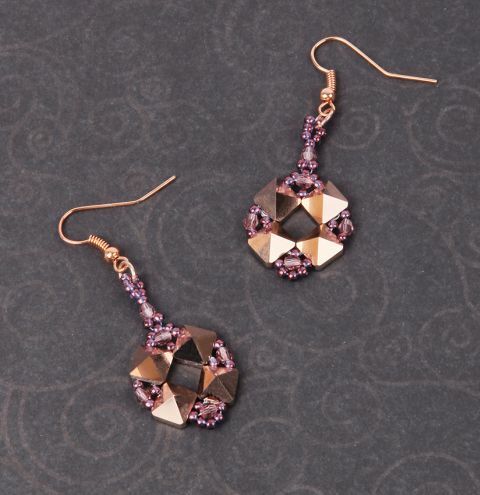 Learn how to make a pair of delicate beaded earrings using the Swarovski Spike two hole beads. Take a 60cm (24") length of thread and add a needle to one end. Thread on 4 x Swarovski square two hole spike bead and 4 x size 11 seed beads alternately. Thread through them all again to make a loop and knot the two ends together to secure this loop. Threading out of a spike bead, change directions by threading through the outer hole of the same bead. Pick up a 1 x size 11 seed bead, 1 x 3mm Swarovski faceted round bead and 1 x size 11 seed bead. Thread through the next spike bead through the outer hole. Repeat this between all 4 spike beads. Thread through the first seed bead you come to, before a faceted round bead. Pick up 3 x size 11 seed beads. Miss out the faceted round bead and thread through the next seed bead and the next spike bead. Thread around to the opposite side of the loop and mirror this pattern so there is 3 seed beads on the top and bottom. Thread around the circle again and thread to the 3 x seed beads you just added at the top of your design. Thread through the first 2 seed beads over the top of your faceted round bead. Pick up 1 x seed bead, 1 x 3mm faceted round, 7 x seed beads. Thread back down through the 1st of the 7 seed beads, the 3mm faceted round and pick up 1 x seed bead. Thread through the same seed bead you exited from on the design. Now you can secure your working cord and tail cord into your design. Thread around the bead work making small overhand knots along the way until you are confident that both threads are secure and won't unravel. Feel free to reinforce the topmost loop of seed beads and any other parts that may need more thread. Trim off the excess thread when you are happy. Finally, open a jump ring and thread on an ear wire. Attach the jump ring onto the seed bead loop at the top of your bead work. Repeat this for your other earring.